If you're thinkin' 'bout my baby, it don't matter if you're black or white. Or, like in this case, you're black AND white. There's black, there's white, and there are even some colors in between: tan, brown, beige. It's one happy bag filled with commingled races of flavor living side by side in harmony. And it tastes good, too. 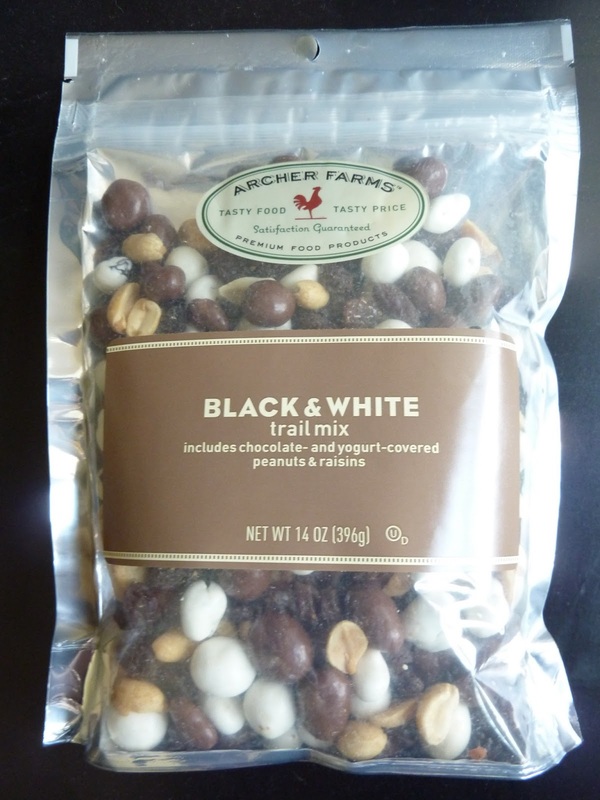 I've always liked the yogurt covered fruits and nuts just as much as the chocolate covered ones. They're both good, and they mix perfectly together. But this is a really sweet bag of trail mix. It's got so much chocolate that I don't think I'd ever crave it while hiking or anything like that. It's almost a dessert type thing. The raisins and peanuts are trail mix-ish by nature, especially the ones without chocolate and yogurt. But at least half of the items in the bag are slathered with sweetness, and they'd most certainly melt in your hand on a hot summer day. Plus, I break out if I eat any significant amount of chocolate. Especially when I'm already sweaty. So as far as this being a trail mix, I don't know if I'll ever take it out on the trails with me. But as far as this being a snack mix, or even a dessert mix, it's one of the best-tasting I've tried so far. My wife Sonia agrees. She thinks it's quite handy for trips in the car, etc. Even though she's not technically scoring these AF products with me on this blog, I usually use her as a sounding board for my ideas. If I think a product is great and she agrees, then I know it's probably not just a personal bias I have. Likewise, if I think a product is awful and she does too, then it's most likely pretty awful to most people. Not always...but often enough. So this blog isn't really just one man's opinion. My wife and I have different enough tastes that when we agree wholeheartedly on something, you can best bet a majority of consumers will agree with us as well. And if you disagree with us, we always invite you to leave a comment stating so below.